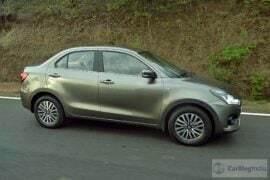 2017 Maruti Dzire Review – Really, Truly Desirable! 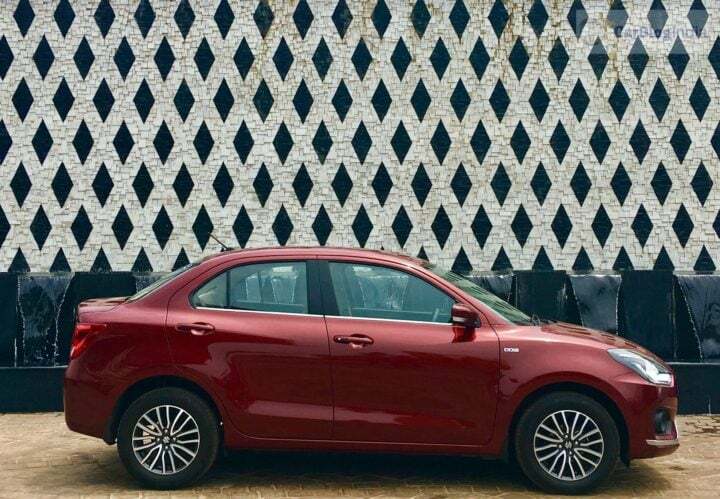 Launched earlier this month, the car you see in the pictures is the all-new Maruti Dzire, which becomes the third generation of Maruti’s hot-selling entry-level sedan. 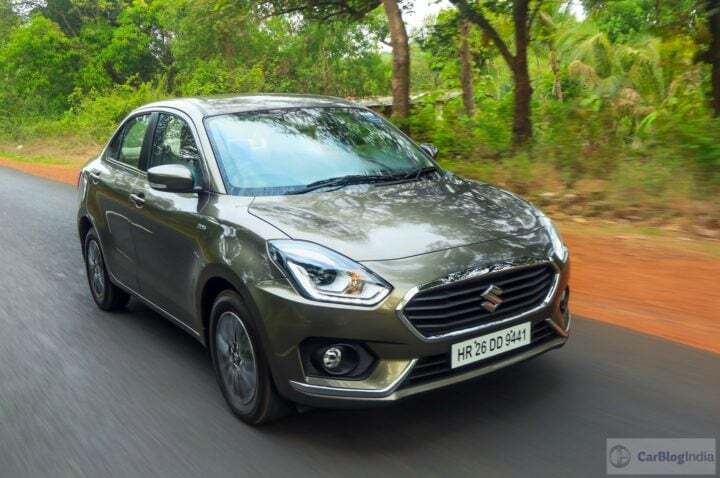 Based on the latest generation Swift hatchback, the all-new Maruti Dzire, unlike its predecessors, isn’t merely a Swift with a larger boot. On the contrary, it was developed alongside the new Swift and the engineers have done enough to draw a significant difference between the two models. In a nutshell, the new Dzire scores much better than the last gen model in terms of design, space, equipment and driving dynamics. But is all of this enough to extend the lead over fairly competent models like the Hyundai Xcent and Honda Amaze? 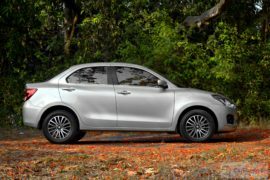 We have tried to answer all such questions in our new 2017 Maruti Dzire Test Drive review here. Exterior Design – Fresh & Classy! As aforementioned, the all-new Dzire was planned and conceived alongside the latest generation Swift. This means that while these two share in plenty, the 2017 Dzire was developed from scratch and isn’t merely a Swift with a larger boot that was added later. 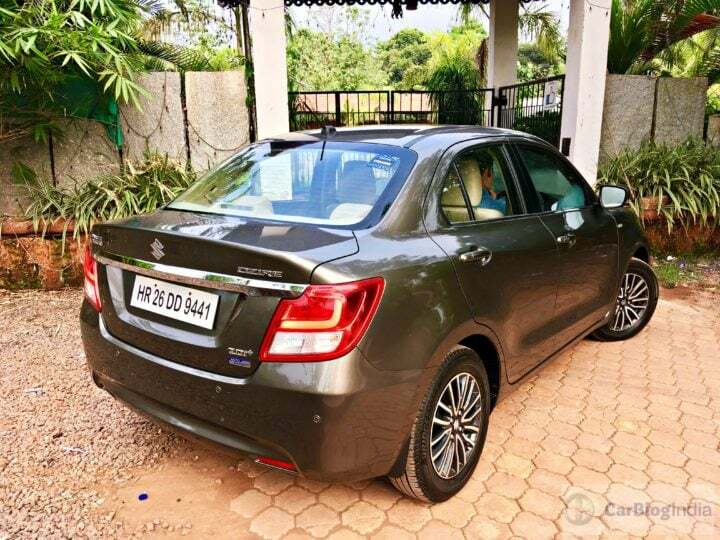 The designers have clearly worked hard to give the Dzire its own unique identity. No wonder then, that, the new Dzire doesn’t look a lot like the new Swift when viewed from any angle. Also, while the new Swift looks sporty, the 2017 Dzire’s design enjoys an upmarket and a slightly classy touch. 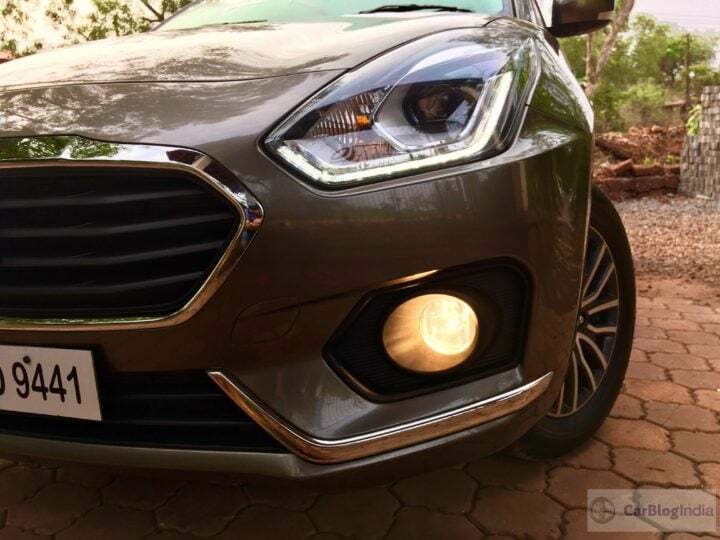 Up front, the new Dzire’s bumper and grille combo looks far different than what you see on the 2017 Swift. The grille boasts enough chrome to please the bling-hungry Indian car-buying audience and the stylish headlamps with projector setups and DRLs further enhance the premium quotient. 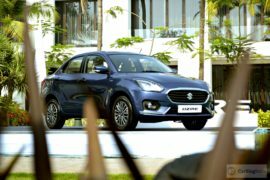 Like we said, the Dzire misses out on the new Swift’s sporty look, but has a definite touch of premium-ness to its design – Just what the doctor ordered! Look at the car’s side profile and you are sure to notice the better proportions this car enjoys over many other sub-4m sedans on sale today. The car’s silhouette is really sleek and it’s noteworthy that the design of this car’s A pillars isn’t the same as those of the 2017 Swift. The rear, of course, is totally new. While the boot continues to have a rather stubby look, we like several styling bits like LED taillights and the rather discreetly integrated boot spoiler. When viewed from certain angles, the new Dzire’s posterior has a slight resemblance with the Kizashi’s rear-end! Interior Design – Clean & Upmarket! The interior is definitely a reflection of the exterior. 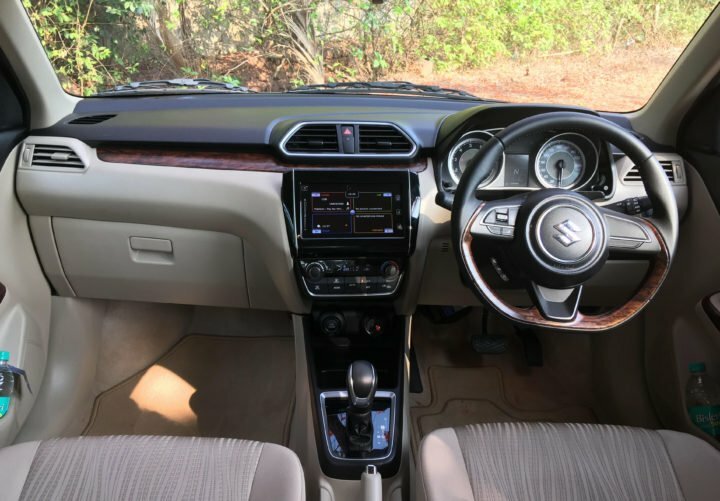 Okay, it misses out on some of the flamboyance, but the cabin of the new Dzire looks fairly upmarket. While the quality of materials remains more or less the same, the new design and bits like a sporty instrument console make the cabin feel really upmarket. Our favorite bit has to be the flat-bottom steering wheel, which does feel pretty sporty to hold. While the 2017 Swift gets an all-black colour theme, the new Dzire enjoys a two-tone black-beige theme with faux wood inserts. Also, the Dzire gets trapezoidal-shaped AC vents instead of round ones on the new Swift. The new car gets an Ignis-like sporty-looking instrument binnacle. Apart from this, the new Dzire is a really spacious car. 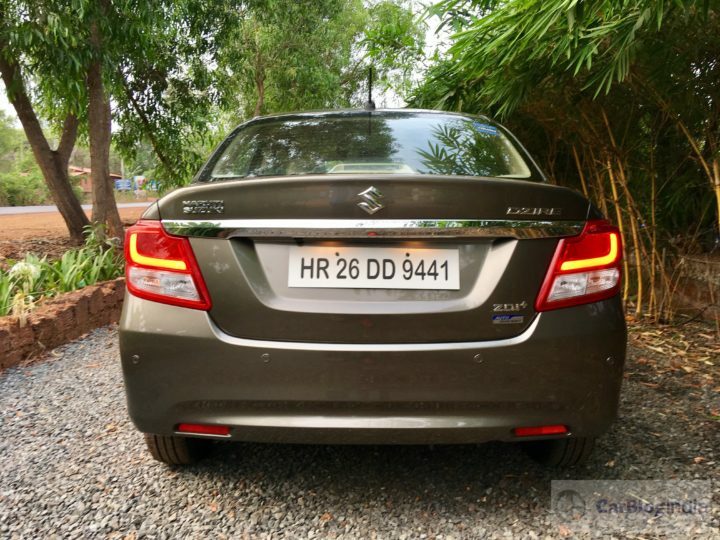 With the new Dzire being as wide as the Ciaz, seating 3 adults in the rear isn’t a problem anymore. Also, a longer wheelbase has resulted into improved legroom. In its latest iteration, the Dzire offers rear AC vents, too. The only little grouse we have here is the slight lack of under-thigh support on rear bench and the lack of a can-holder on the dasboard, but we might be nitpicking here. 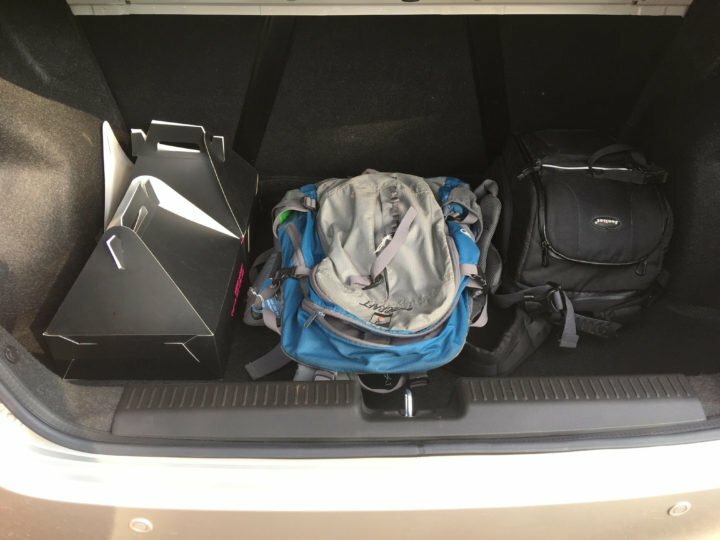 The new car gets 378-litres of boot space, which means the car offers a much higher luggage-carrying capacity than its predecessor. The new 2017 Maruti Dzire is available in L-, V- and Z-level trims. The top-end ZXI+ and ZDI+ trims offer some really upmarket features like – Rear AC Vents, Auto LED Projector Headlamps and Touchscreen AVN with Apply CarPlay and Android Auto. While there’s no auto-dimming internal rear view mirror on any of the trims, the fact that Maruti is offering ABS and dual front airbags as standard across all the trims is nothing short of laudable. Engine & Transmission – Tried & Tested! The new 2017 Maruti Dzire is all-new in most aspects. From a fresh design to a modern platform, the 2017 Dzire reeks of newness and modernity. It’s however interesting to note here that the engine options for the latest Dzire have been carried over from the outgoing model. Of course, the motors have been re-tuned for their application in the new car. 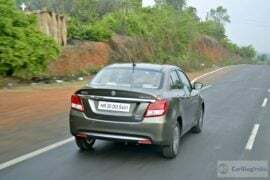 While the Petrol variant’s 1.2 L K-series, 4-cylinder, normally-aspirated engine outputs 87 PS-115 Nm, the Diesel model’s 1.3 L DDiS, 4-cylinder, turbocharged engine outputs 78 PS-190 Nm. Both the engines can be bought with either a 5-speed Manual Transmission or a 5-speed AMT. ARAI mileage figures are 22 KMPL for the petrol and 28.4 KMPL for the Diesel model, which makes the new Dzire Diesel the most fuel efficient car in India! We drove the petrol variants first and as we expected, the engine is high on refinement and the NVH levels are really low. Also, thanks to a lighter kerb weight, the car feels sprightlier and slightly quicker. 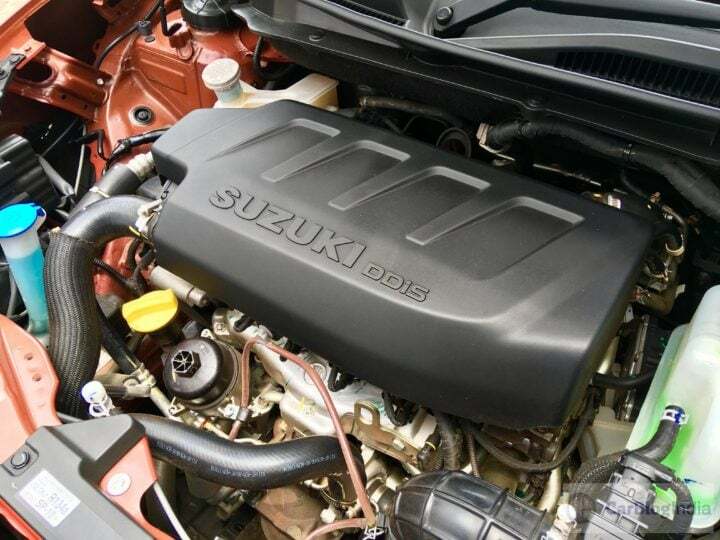 The engine is a pretty rev-happy unit and you’ll enjoy the rather sporty engine sound note. Torque spread is decent and the car enjoys good tractability when driven at really low speeds on congested city streets. Unlike earlier, the low-end power delivery is decent. Like we said, the engine loves to rev all the way till its redline and its eager performance, coupled with a low overall weight, translates into brisk acceleration. Even the AMT variant left us impressed. While the shift quality from the AMT isn’t comparable to the lightning fast DSGs, Maruti has worked hard enough to ensure that the gearshifts are smooth and as seamless as possible. This has to be the most well tuned AMT we’ve experienced in this segment. While the Petrol model left us impressed, it’s the Diesel version that really won our hearts. 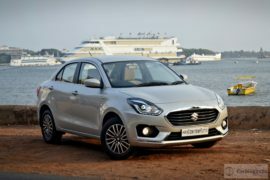 Believe you me, Maruti has done wonders with the way it has tuned the Fiat-sourced 1.3 Multijet motor for the new Dzire. The turbo lag is really much better controlled and the engine builds speed rapidly from as low as 1,000 RPM. Yes, there’s some Diesel engine clatter creeping into the cabin, but the NVH levels are still pretty high. While missing out on the sporty top-end performance of its petrol sibling, the Diesel model does offer better in-gear acceleration. We managed to hit a speedo-indicated 160 KMPH on a really long straight of Goa-Mumbai expressway! Overall, it’s tough finding a fault with the engine and transmission options available on Maruti’s latest compact sedan. Ride & Handling – Comfortable & Composed! The latest generation of Maruti’s popular sedan is underpinned by the modern Suzuki 5th generation B-platform. Maruti claims the new-age platform is light, rigid and strong. Hence, the new platform goes on to play an important role in enhancing the vehicle dynamics and safety. Also, being light in weight due to usage of high-tensile steel in its construction, the new platform helps optimize performance and fuel efficiency. The new car gets a McPherson suspension setup at front and Torsion Bar at the rear. The new Dzire offers a pretty comfortable ride on most surfaces. It does get a bit jittery over sharp undulations, but the ride quality is high on most roads. 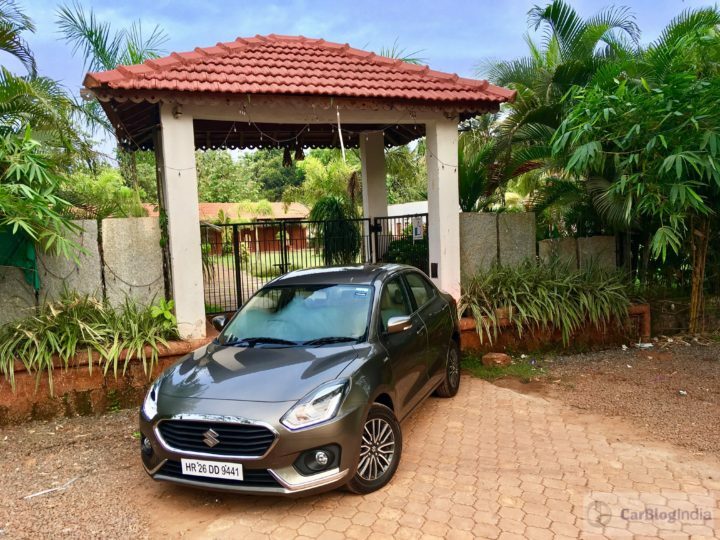 The Dzire certainly can’t match the matured ride of some bigger sedans, but for a car retailing in its price bracket, the Dzire scores well in this department. The steering feels good to hold and isn’t very light, especially on the Diesel model. However, being a low-cost EPS unit, there’s definitely a lot of vagueness towards the centre. The most keen of car enthusiasts won’t fall in love with this car’s handling characteristics, but most other drivers are likely to appreciate the not-too-light steering and minimal body roll. 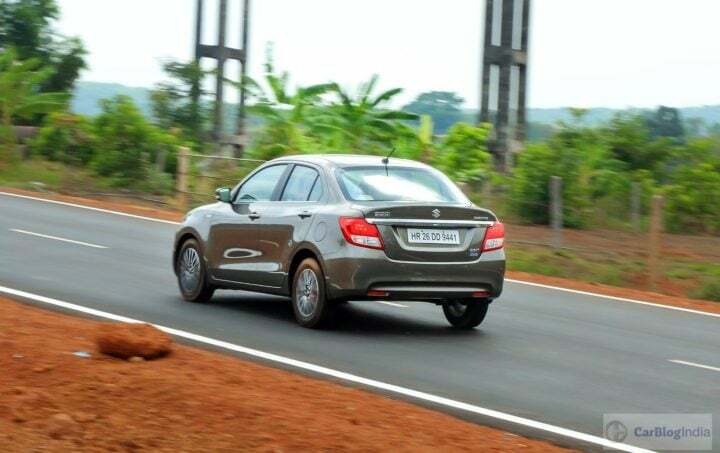 Also, the car exhibits decent high speed stability, with the car feeling planted upto speeds of 140 KMPH. This is something that’s hardly seen on any other Maruti in this price range. 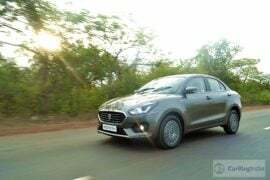 Stay tuned to CarBlogIndia for more test drive reviews like the new 2017 Maruti Dzire test drive review we have here. 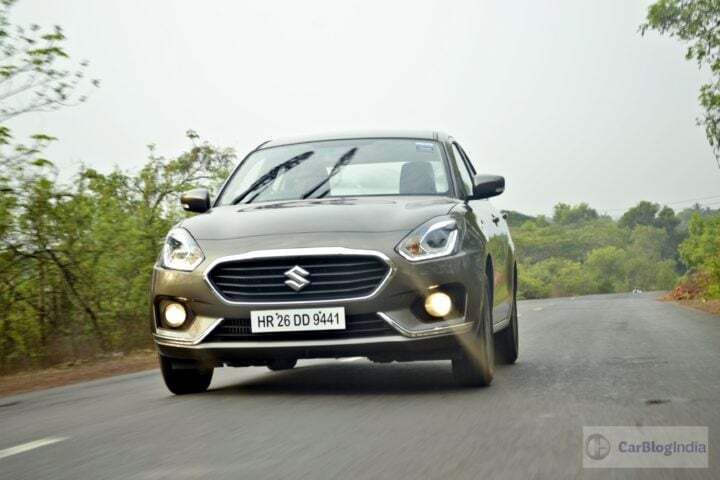 Also, what do you have to say about our 2017 Maruti Dzire test drive review? Do let us know by commenting below.